I never seem to find a pocket mirror when I need one. 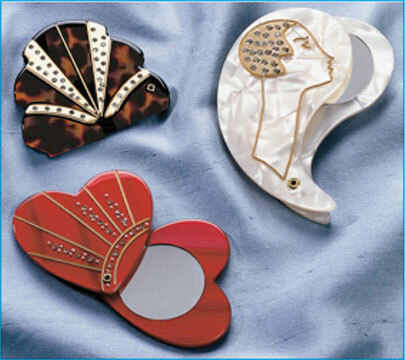 Well, here’s a collection of 3 mirrors perfect for pocket or purse or drawer. Each of the colorful and fun shapes swings open to reveal a 1-1/2” diameter mirror—big enough to easily see what you need to see. Made of marble-looking plastic, inset with gold and crystal-like stones, sizes vary from 3” to 5”.